If you are visiting Tokyo, Asakusa and Sensoji Temple are likely on your itenerary. When you visit you will see many visitors enjoying rickshaw rides, as well as many rickshaw drivers in traditional attire offering rides. The uniquely Japanese mode of transportation dates back to Tokyo in the late 1860s and is thought to have been inspired by mixing the traditional palanquin with the wheels seen on horse carriages that arrived after the country opened up to outside counties and foreigners started coming to the city. The name “rickshaw” is the English version of the Japanese jinrikisha (人力車) – or person-powered wheels. Unfortunately, the height of the seat, combined with the angle and handle bars of the rickshaw, make it impossible for anyone with a mobility disability to enjoy the experience. 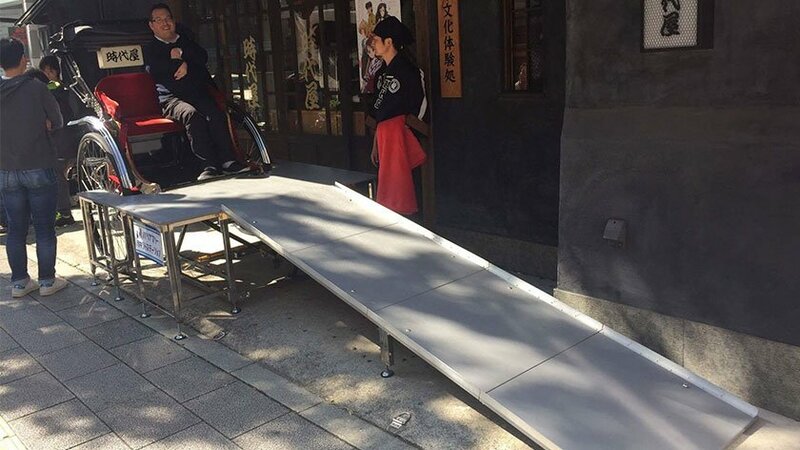 One company in Asakusa – Asakusa Jidaiya – has created a special ramp to allow manual wheelchair users to take their wheelchair up a slope to the rickshaw and transfer on a stable platform. The platform is then disassembled and the driver can gently move onto the street for the ride. Asakusa Jidaiya made the ramp after seeing that many people with disabilities, as well as those who are elderly, wanted to enjoy the experience but had no way to do so. While the ramp can support a power wheelchair, it is rather steep. Accessible Japan has asked the company to consider having a manual wheelchair on hand so power wheelchair users can transfer to the lighter wheelchair to get up the ramp easier. The company said they plan to do so. It should be noted that the seat in the rickshaw has low arm rests. We suggest riding with someone who can assist with balance during the ride. Be sure to tell the driver as well, so they can adapt the route to have fewer turns of needed. Reservations should be made in advance, so, please contact Asakusa Jidaiya in advance and enjoy Asakusa from a new angle!